Enjoy plant power. Ice cream made from hazelnut. 100% plant-based. 30% less sugar & saturated fats. Free from dairy and gluten. Free from colours. Vegan. 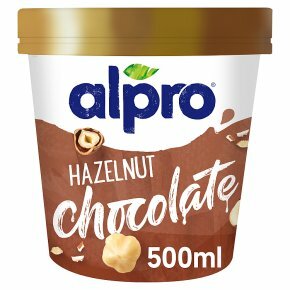 Enjoy Alpro° Ice Cream made from nature's tastiest ingredients Alpro® Hazelnut Chocolate is made from carefully selected hazelnuts, giving our ice cream its delicious rich taste & creaminess, which are then perfectly blended with real chocolate. With less sugar & saturated fats than the market reference in ice cream, Alpro® Ice cream is a delicious treat to indulge in! 2 x scoop = 100 ml/68 g, 500 ml = 5x (2x scoop) For an optimal product experience, remove from freezer 5 minutes before serving.